The Avid Diva II is the most affordable turntable in the Avid range and yet it shares the aesthetic and many of the key elements of the more expensive models. Unlike those, however, it is not a spring suspended design: instead, its three feet contain a 'triple elastomer layer system' using a Sorbothane isolating/damping compound. The mounting of the chassis to these three pods is certainly compliant, but it's a pretty stiff support system and there's certainly no danger of bounce. The core of the turntable is an aluminium casting that sits on the three feet and supports the turntable bearing and the armboard. You can see this component on all the Avid designs, but usually it sits in a sprung suspension. The main bearing has tungsten carbide/sapphire at its thrust point and does not require any lubrication as it uses oil-impregnated phosphor bronze bushes. The brass bearing cap comes right through the centre of the platter, where its coarsely threaded spindle accepts a very chunky SME-style screw-on clamp. The coarse thread does make for quick clamping, but it's easy to put the thing on at the wrong angle if you're in a hurry: a little patience is still required, but it is a lovely clamp. The platter itself is made from MDF and topped with cork in the style of other Avid designs. The motor is a separate unit in a heavy steel housing that sits underneath the platter and transmits drive via a round belt to a steel sub-platter. The motor is switched on and off by a separate power supply in a well-finished case. Speed change is not achieved here: this is achieved in the old-fashioned way with an alternative drive pulley. The Jelco arm is supplied by Avid, as is the cast mounting plate that it sits on. This is a simple Japanese design with VTA adjustment, sprung anti-skate and dynamic downforce. The arm cable is a plug-in type with an SME connector and can be upgraded if required. Alongside the Townshend entry, the Diva II is one of the most neutral sounding turntables around. It has a relatively dry balance that is closer to CD – a quality that will not necessarily endear it to vinyl fiends. That said, it's a vibrant and pacey deck that's slightly lean through the upper bass and has reasonable, if not totally enthralling, timing. It's also appealingly open, a quality that combines well with strong bass, but imaging could be stronger. Surface noise is kept well at bay, helpful with even slightly worn LPs. String tone is better than average and at least one panellist thought he heard a resemblance to its first presentation several hours earlier. We were a little surprised that, despite a good showing, the Diva II didn't seem to perform as well as its predecessor, the original Diva, did back in 2003. That model was rather different, however, and had an SME Series 309 tonearm onboard. 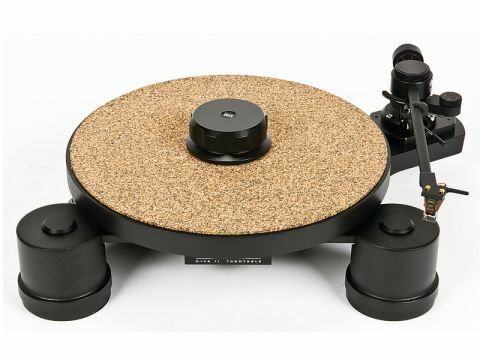 It's possible that the Jelco tonearm, while nicely built, does not have the integrity of the Rega RB300/301 found on many similar turntables in one form or another. Putting the deck on our Townshend VSSS stand clearly helped, increasing soundstage scale and adding bass weight – but not enough to bring out genuine star quality.